Packaging has traditionally been easier to whip up and photograph compared to an actual toy. Here we see that boxes were printed, but for some reason the stickers for each cassette were not or surely we would be looking at the other side of at least one of those cassettes. 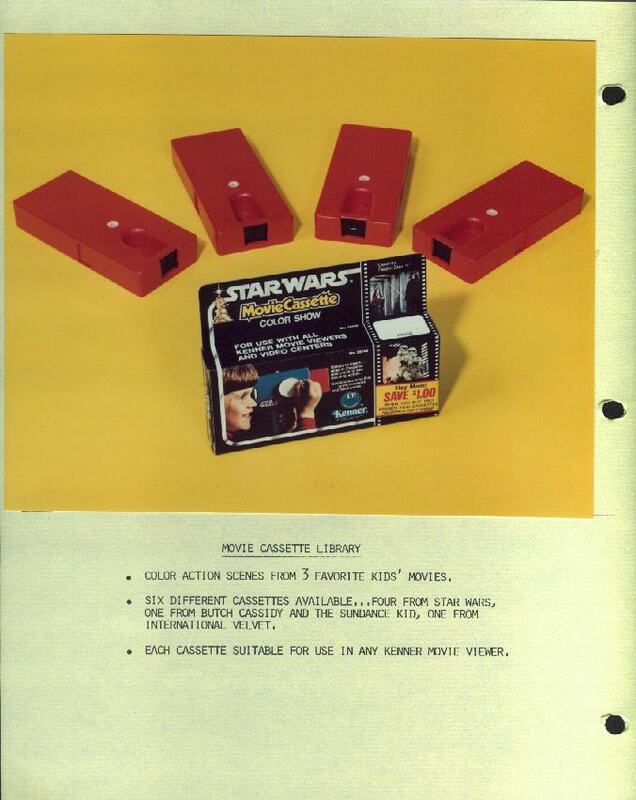 Since this movie-viewer concept was used for Kenner's $6 Million Dollar Man line and I'd guess that those cassettes in the photo aren't really of Star Wars, but of Steve Austin. Notice that Kenner was offering 6 tapes with 4 Star Wars, one Butch Cassidy and one for the failed International Velvet toy line. It doesn't appear that they ever made the Butch Cassidy tapes and I don't think the International Velvet idea floated either. A retired Kenner salesman told me that Internatioal Velvet was a big push that went nowhere fast. I guess that a racing horse movie couldn't match the selling power of Easy Bake Ovens and Darth Vader action figures. This Kenner product sheet is part of a 3-ring notebook containing early photography and descriptions of roughly 30 Star Wars toys. Each sheet has the same format with typed information about the product and a pasted-on glossy photo. Most photos are representations of the toys but they often differed from their released counterparts which makes it quite unique to look at. These were generally mock-ups of sorts created because the toys weren't ready in time for photography and early marketing. This book came from an ex-Kenner model maker who was dilligently tracked down by a collector. Many thanks go out to that collector for helping turn up a piece of history like this.